Even electrical contractors with five-star ratings on Yelp require continual marketing to keep their business fresh in the minds of the consumers they serve. 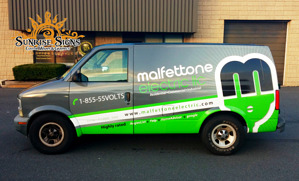 Case in point is Malfettone Electric located in Jersey City NJ. When owner Mike Malfettone asked Sunrise Signs to dress up their Chevy Astro work van, we gladly accepted!